Pine Grove Furnace State Park and the Michaux State Forest offer something for everyone within a short drive from all points in Central Pennsylvania. Laurel Lake and Fuller Lake provide beach access, swimming, boating and fishing. 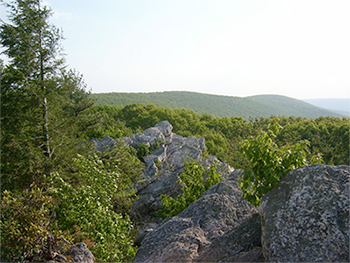 The Appalachian Trail, whose midpoint and new museum are found in the area, winds throughout the Park and Forest. Numerous other trails and natural points of interest are found throughout the area, as well. The Mountain Creek, and various smaller “runs”, provide year round fishing opportunities for the fly and trout enthusiast. Some 300 + recreational cabins are situated in “Pine Grove” and are periodically available for sale on the open market. The cabins are situated on land sites which are leased from the Commonwealth of PA, but are owned privately. The cabins tend to be in great demand and typically sell in a range of $70,000 to nearly $200,000 depending upon location and amenities such as well/water, septic, and size. Many of the cabins are traditional chestnut log cabins, although other styles and structures can also be found throughout the Park and Forest. While year round living is not permitted, many of the cabins can be used on a recreational basis throughout the year and all are used at least seasonally. Wolfe & Company Realtors is the leading provider of recreational cabin sales within the Pine Grove Furnace State Park and Michaux State Forest. DCNR Bureau of Forestry maintains more than 4,000 leased campsites across Pennsylvania. A State Forest Leased Campsite is a small parcel of state forest land (approximately 1/4 acre) that is leased to an individual or to a group of individuals to maintain a cabin solely for recreational purposes. What is a State Forest Leased Campsite? A state forest leased campsite is a small parcel of state forest land (approximately ¼ acre) that is leased to an individual or to a group of individuals for the purposes of maintaining a cabin to be used solely for recreational purposes. The parcel of land remains the Commonwealth of Pennsylvania’s property. How can someone obtain a lease? The Department stopped leasing new campsites in 1970. However, there are over 4,000 leased campsites that are still in existence. If an individual is interested in obtaining a lease, they must find a cabin on a leased campsite that is for sale, purchase it and request that the lease be transferred to them. Who is eligible for obtaining a lease? State forest leased campsites can only be leased to Commonwealth of Pennsylvania residents. Non-Pennsylvania residents are not permitted to obtain a lease. How many years are the leases good for? What is the current annual rental fee for a leased campsite? The current rental fee is $200.00 a year. Are there any special regulations or conditions that a lessee must abide by? Yes. In addition to the standard State Forest Rules and Regulations that all state forest visitors must abide by, there are also specific Guidelines for Leased Forest Campsites (Adobe PDF, 91 Kb). Who owns the cabin and the other improvements on a leased campsite? All improvements located on a leased campsite are considered to be private property. If the cabin and the other improvements are private property, how can DCNR require lessees to maintain their improvements and the leased campsite in a certain way? Even though the structures on a leased campsite are privately owned, the land is still public land, and part of the State Forest system. The Department requires all lessees to maintain their leased campsites such that it is neat in appearance and does not drastically contrast with the surrounding State Forest land. State Forests receive many visitors and the Department wants to avoid having its’ visitors being exposed to facilities that are not well maintained. Can campsite leases be terminated? Yes. A lease can be terminated for any violation of the provisions set forth in the lease and/or the Guidelines for Leased Forest Campsites (Adobe PDF, 91 Kb). The Department also reserves the right to terminate a lease if the Department determines that a site is needed for a higher public use. How can someone get a copy of the Guidelines for Leased Forest Campsites? The Guidelines for Leased Forest Campsites (Adobe PDF, 91 Kb) can be obtained by clicking on the highlighted text and print the nine (9) page document or by requesting a hardcopy from one of the Forest District Offices. What program(s) does DCNR fund or use the rental payments collected for? All of the annual campsite lease rental fees collected by DCNR, Bureau of Forestry goes directly into the Commonwealths general fund. Thus, the Bureau of Forestry does not receive any money from the forest leased campsite program directly. Are lessees required to pay any local taxes? Yes. Buildings erected on a state forest leased campsite are considered as real estate for taxation purposes. Therefore, all lessees are responsible for any annual local tax payments that are assessed on the structures located on a leased campsite. How many leased campsites are administered by DCNR? 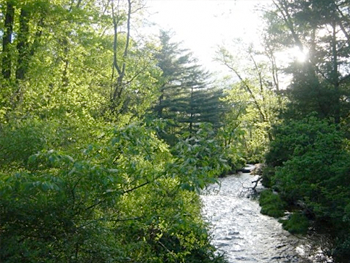 The DCNR, Bureau of Forestry administers approximately 4,000+ leased campsites. 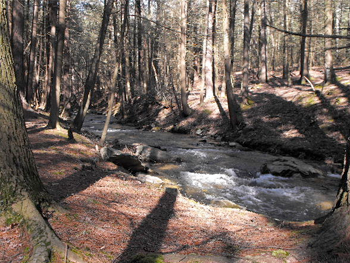 Is DCNR leasing any new campsites? The Department stopped leasing new campsites in 1970 and under no circumstance are any “new” leases being granted. Does DCNR have a list of campsite Lessees that are selling their cabins? The Department does not maintain an official list of available leased campsites or a list of names of individuals looking to sell their cabins. How do I find a lease that is available? Start by contacting the Forest District Office in or around the desired campsite lease location. The district offices sometimes know of cabins that may be for sale, or could possibly put you in contact with a real estate agent who has routinely handled sales of cabins in the area.